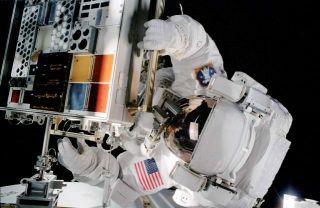 Astronaut Patrick G. Forrester, during the second STS-105 extravehicular activity, prepares to work with the Materials International Space Station Experiment 1 and 2(MISSE-1 and 2). The experiment was installed on the outside of the Quest Airlock during the first extravehicular activity (EVA) of the STS-105 mission. Teflon-coated frying pans may scratch easily, but a souped-up version, ananomaterial 10,000 times more durable than the ordinary non-stick stuff, isheaded for the space station to see if it could someday coat the mechanicalmoving parts of spacecraft. But first it must prove it can survive ultraviolet radiation, atomicoxygen, extreme temperatures and other space hazards, afterblasting off Monday aboard the space shuttle Atlantis for theInternational Space Station (ISS). Astronauts intend to install the material outside the space stationduring one of the mission's planned spacewalks. The super Teflon could theoretically slide across a surface for morethan 62,000 miles (100,000 km) before wearing away, compared to ordinary Teflonthat would last just a mile or so. Researchers added fluoride-coated aluminananoparticles that helped boost the material's strength and durability, even asit retained most of the Teflon's non-stick slipperiness. "These are low wear, low friction materials that work well invacuum, and we want to know if they work well in space," said Greg Sawyer,a mechanical and aerospace engineer at the University of Florida. He leads amulti-university effort backed by the U.S. Air Force that designed a wholerange of nanocomposite materials for space trials aboard the space station. Sawyer worked with his former mentors at the Rensselaer PolytechnicInstitute (RPI) in New York to develop nanocomposite materials for manydifferent space applications. Super Teflon's durability and non-stick characterwould make it easier for moving parts within spacecraft to move, and requireless energy due to less resistance from friction. Rensselaer researchers also built conductive nanocomposites incollaboration with the U.S. Department of Energy National Renewable EnergyLaboratory. One material consists of a tough polymer filled with carbonnanotubes, or tiny cylinders made of carbon that can conduct electricity.The second conductive material involves liquid crystalline polymers, which can resistfires and many industrial chemicals. "Conductivity experiments look at how materials with conductivitydegrade over time," Sawyer told SPACE.com. "With PTSE [Teflon]and those materials you're looking at how long they can provide adequate lubrication." Another even more futuristic material comes in the form of so-called"chameleon" coatings developed by the Air Force Research Laboratoryin Ohio. These adaptive materials can change their coating surfaces based onhow much friction or strength is needed. Researchers ensured that all the nanocomposite materials flying aboardthe space shuttle Atlantis could first endure vacuum tests on Earth, as a bareminimum requirement for surviving space trials. The team had to scramble in particularto develop the conductive nanocomposites and ready it for launch in less than aweek. "It was an exciting week and we weren't sure if the compositeswould hold up to the rigorous testing imposed on them to determine if theycould even be launched into space," said Linda Schadler, a materialsengineer at RPI. The Teflon study is part of a larger Materials International SpaceStation Experiment - 7 (MISSE-7) that will expose materials on an outside testbed, where the experiments face intense radiation and temperatures ranging from-40 degrees to 140 degrees F (-40 degrees to 60 degrees C). Atomic oxygenformed by ultraviolet rays splitting oxygen into single atoms also poses aunique space hazard that can erode materials. Sawyer designed a tribometer that can monitor the friction of thematerials such as the super Teflon. The material sample sits on a turntableresembling a record, and stationary pin rests on top of the spinning sample. "The sample spins under the pin, and during that we can record theforces so we know how the material is behaving," Sawyer explained. The experimental setup automatically sends data in real-time to the ISSlab, which then forwards the info to university labs on Earth. After all thework that went into getting their materials launched into space, researchersplan on running the space trials for as long as possible. Ultimately, MISSE experiments - which can be folded up like a suitcase ?can be collected by spacewalking astronauts to be packed up and returned toEarth for waiting scientists.